Susie Ghahremani is an award-winning illustrator and a graduate of the Rhode Island School of Design (RISD). When not painting tiny paintings, illustrating children’s books, designing stationery and gifts, teaching at RISD, exhibiting her work internationally, shipping orders, or connecting with the illustration community, she lives in sunny San Diego with her husband and zillions of pets. "Counting from one to 10 is the usual math activity in simple picture books, but this one takes on other mathematical operations, too... Thanks to its gentle inconsistencies, this is a book that can expand children's thought processes." "Crisp, bold illustrations to introduce simple math concepts that go beyond the usual counting fare for the very young... A simple yet clever lesson that there’s more than one way to stack some cats. Ideal for one-on-one and small group sharing." "As fun as it is clever, Ghahremani’s cat-infested concept book is a treat." 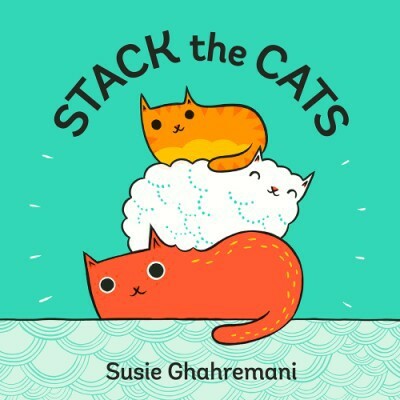 "Ten cats attempt to stack themselves into impossibly adorable towers in a book that’s ideal for children (or adults). . . The cats all but beg to be named by readers, who will flip back through this sublimely silly outing to choose their favorites." "Cat lovers will pore over the fluffy, fuzzy, striped, and splotchy felines rendered in clear digital hues that pop against mint-green and orange backgrounds...though listeners should probably be warned that stacking may not go over well with actual cats." "Brightly colored, this utterly charming board book teaching children how to count to ten (and back again!) is very highly recommended for family, daycare center, preschool, elementary school, and community library collections."